The ‘Yellow Vest’ anti-government protests in France have received limited coverage in Western media and what coverage there has been has been quite hostile to the protestors. In Venezuela though it’s a very different story. Here the street demonstrations are a major news event, despite the country being thousands of miles away. Furthermore, the coverage is very sympathetic to the protestors and extremely hostile to the government. — Neil Clark (@NeilClark66) 23 января 2019 г. 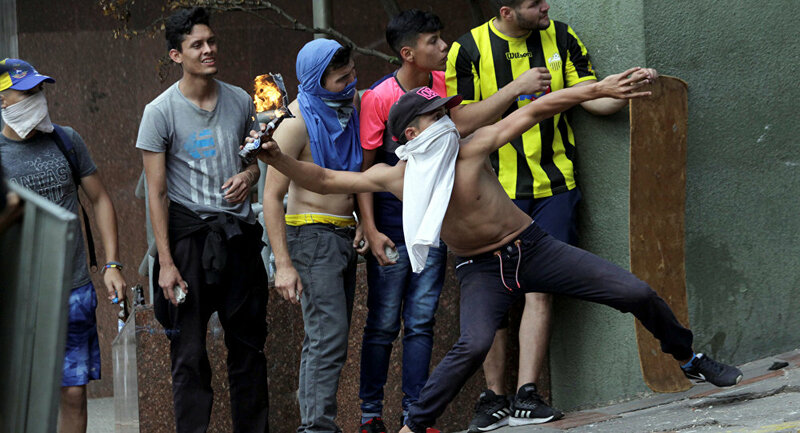 Why are angry street protestors in France bad, but in Venezuela very good? The answer has to do with the stances and international alliances of the respective governments. It’s inaccurate to call President Emmanuel Macron of France the President of the rich. He is, as his predecessor Francois Hollande admitted on French television, the President of the very rich. Macron is an unashamed globalist, committed to carrying out neoliberal reforms at home, and following a ‘liberal interventionist’ ie imperalist foreign policy abroad, which means keeping French forces —illegally- in Syria. No wonder the elites are mad about the boy. The toppling of Macron, in a French Revolution 2.0, would be a huge blow to the most powerful people in the world. It cannot be allowed to happen. The French authorities have responded to the street protests with force; one activist was even sentenced to prison for six months — but this has largely been ignored by Western 'liberals' who would be so quick to denounce similar actions in other countries, whose government they don’t approve of. Instead, the message is 'law and order must be maintained'. The Yellow Vests protestors have been relentlessly traduced. We were told they were 'far-right' and 'racists' and even 'anti-semites'. The conspiracy theory that they were part of a sinister Russian plot to sow division in Europe was also promulgated, by those who routinely attack others for being conspiracy theorists. By contrast, the anti-government protestors in Venezuela can do no wrong, even when they commit terrible acts of violence. Those who falsely accuse their Gilets Jaunes of being motivated by 'racism' were silent when a black man, the 21-year-old Orlando Jose Figuera was burnt alive by anti-government protestors in Caracas in 2017. Imagine the outcry if the Yellow Vests had set fire to a black man in Paris. But it’s anti-Chavistas doing it in Venezuela, so let‘s close our eyes and pretend it didn’t happen. While there is absolutely no evidence of any foreign involvement in the Yellow Vest protests, the US and its allies have been openly backing the anti-government protests in Venezuela. Trump has even recognised Venezuela’s opposition leader, Juan Guaido, as the leader of the country. Again, imagine the headlines if Vladimir Putin recognised Marine Le Pen or Jean-Luc Melenchon as the leader of France — or said, as Trump has said about Venezuela, that Russia could invade France if the government didn’t stand down! The US move has already been endorsed by EU bigwigs, like Guy Verhofstadt, reminding us that for all their criticism of Trump, these virtue-signalling politically-correct European ‘liberals’ are on the same page as the US when it comes to imperialistic regime-change operations. It's not just Venezuela, it was the same in Yugoslavia in 2000 and Ukraine in 2014. It’s a crowded field, but the prize for the biggest hypocrite of all goes to Emmanuel Macron. The man who has been clamping down on legitimate street protests at home, and whose approval rating slumped to just 21% earlier this month, published a tweet in which he praised ‘ the courage of the hundreds of thousands of Venezuelans who are marching for their liberty". For the Yellow Vests protestors, and indeed for anyone else who genuinely supports liberty, that really is one sick joke.